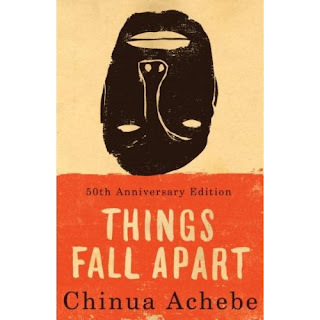 One of the most widely read novels from Nigeria's most famous novelist, Things Fall Apart is a gripping study of the problem of European colonialism in Africa. The story relates the cultural collision that occurs when Christian English missionaries arrive among the Ibos of Nigeria, bringing along their European ways of life and religion. In the novel, the Nigerian Okonkwo recognizes the cultural imperialism of the white men and tries to show his own people how their own society will fall apart if they exchange their own cultural core for that of the English. --This text refers to the Hardcover edition. Okonkwo is the greatest warrior alive, famous throughout West Africa. But when he accidentally kills a clansman, things begin to fall apart. Then Okonkwo returns from exile to find missionaries and colonial governors have arrived in the village. With his world thrown radically off-balance he can only hurtle towards tragedy. Chinua Achebe’s stark novel reshaped both African and world literature. This arresting parable of a proud but powerless man witnessing the ruin of his people begins Achebe’s landmark trilogy of works chronicling the fate of one African community, continued in Arrow of God and No Longer at Ease. Chinua Achebe was born in Nigeria in 1930. He was raised in the large village of Ogidi, one of the first centers of Anglican missionary work in Eastern Nigeria, and is a graduate of University College, Ibadan. His early career in radio ended abruptly in 1966, when he left his post as Director of External Broadcasting in Nigeria during the national upheaval that led to the Biafran War. Achebe joined the Biafran Ministry of Information and represented Biafra on various diplomatic and fund-raising missions. He was appointed Senior Research Fellow at the University of Nigeria, Nsukka, and began lecturing widely abroad. For over fifteen years, he was the Charles P. Stevenson Professor of Languages and Literature at Bard College. He is now the David and Marianna Fisher University Professor and professor of Africana studies at Brown University. Chinua Achebe has written over twenty books – novels, short stories, essays and collections of poetry – and has received numerous honours from around the world, including the Honourary Fellowship of the American Academy of Arts and Letters, as well as honourary doctorates from more than thirty colleges and universities. He is also the recipient of Nigeria's highest award for intellectual achievement, the Nigerian National Merit Award. In 2007, he won the Man Booker International Prize for Fiction.